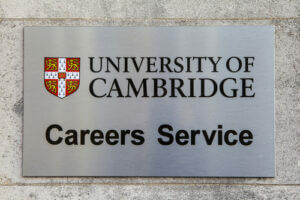 A sign at Cambridge University marking the location of the Careers Advice Centre in Cambridge. Photo courtesy of Shutterstock. Have you ever set foot in your college career center? Were you even aware that your college has a career center? You may have walked by its door a few times, but like most students you’ve probably never gone in – and that’s a terrible waste of a very valuable resource. The experienced staff is there to guide and help students towards the careers of their dreams. Make use of their expertise – that’s what they’re paid for! It’s never too early to call the career center for help and advice. Here are six tips to make the most of your career center. Starting college, students may think it’s far too early to be worrying about their careers. But the career center is there to help students at all stages of their studies. The career center staff can advise students on what to do after they finish their studies and which route to follow to get them where they want to be. Students don’t have to be at the end of their studies and looking for a job right now. In fact, the earlier students get started, the more likely they’ll be on the right path. Social networks existed in the real world long before the internet, so make contacts in person whenever possible. Students never know who could offer them interesting and fulfilling careers in the future. Make an impression and be the person employers remember in the future when they’re looking for someone to fill a vacancy. Knowing the right people still makes a big difference when it comes to finding work. The career center can put you in touch with relevant organizations and will also know of networking events where students can meet professionals in the field they’d like to work in. Career center staff members want one thing – to find students good jobs. If students have taken the time to get to know the career center staff during their studies, it will be very satisfying to them that the staff found jobs for them, and finding students jobs aids career center staff members in accomplishing their goals as employees. It matters to them that you succeed. While students can always look on free job sites, the college career center may have additional options available as well. They will have subscriptions to many useful sites, and students can also benefit from professional resume services at low cost or even free. Sometimes you get what you (or they) pay for, and that can mean more that you can access. Have you always thought that psychometric testing platforms like Myers-Briggs are nonsense? Check them out at the career center and learn a lot about yourself. These tests aren’t about giving the right answer and can be very useful in helping students decide what to do for their careers. By identifying their strengths, interests, and talents, students may find themselves heading in very different directions from what they originally intended. The career center can then help them decide on the courses to take in order to get where they want to go. Career centers all want the same thing – to get students jobs – but it’s worth checking out what little extras your particular one offers. They may have some very handy perks for students such as business cards or professional photos for their resumes and LinkedIn profiles. Students won’t know until they ask what the career center can do to help them! Students often take more interest in facilities like the student bar or on-campus accommodation, but the career center is a hidden asset that often gets overlooked. They’re paying for the services the center provides, so it makes sense to use them – it could get students their dream jobs! Benjamin Forester is a freelance writer and a passionate essayist. He provides college students with academic help and leads his own site dedicated to college life and writing.